Arthritis can make simple daily tasks a struggle and sleeping on an uncomfortable mattress with arthritis can make a bad problem even worse. If you have arthritis, you want to make sure you have the best mattress to ensure you get a more restorative and comfortable sleep. Here is a look at some of the best mattresses for arthritis sufferers. Is There One Type Of Mattress That Is Best For Arthritis? Because arthritis can affect different people in different ways, it’s hard to choose just one type of mattress that will work for everyone. There are a few varieties that are better than others, but it’s all going to come down to personal preference. There are a few things you don’t want your mattress to have if you suffer from arthritis. Many people think that they need to have a super firm mattress to help support their body while they sleep. This could cause extra problems though because it can put pressure on your already sore joints. You also don’t want a super soft mattress. A very soft mattress might feel more comfortable while you’re lying down, but it can make it hard to move around while you’re sleeping. That might not be a problem for someone without arthritis, but if you do have arthritis struggling to move while you sleep can inflame your joints and cause more problems. What Type Of Mattress Should I Look For? This is going to be your best bet when it comes to mattresses. Hybrid mattresses are typically made with both coils and memory foam, but you can find a few hybrids that are made with coils and latex foam or latex and memory foam. The big advantage of hybrid mattresses is that they can combine the two big things that arthritis sufferers need; good support but a soft surface to lay on. Most hybrid mattresses will have a very solid and supportive base whether it’s high-density memory foam or an innerspring system. Then on top of this support surface there will be a soft sleep surface layer. The level of firmness and softness that you need will be unique to you, but a hybrid mattress can offer the best of both worlds. These mattresses are not the ones that you can find in the camping section of your store. These types of mattresses have air chambers that you can control with a remote control and these air chambers are covered with a mattress topper that can be made of foam or gel. These beds are nice for people who have arthritis because it can allow you to customize your comfort level. Arthritis pain can change from day to day and some days there are bad flare ups. 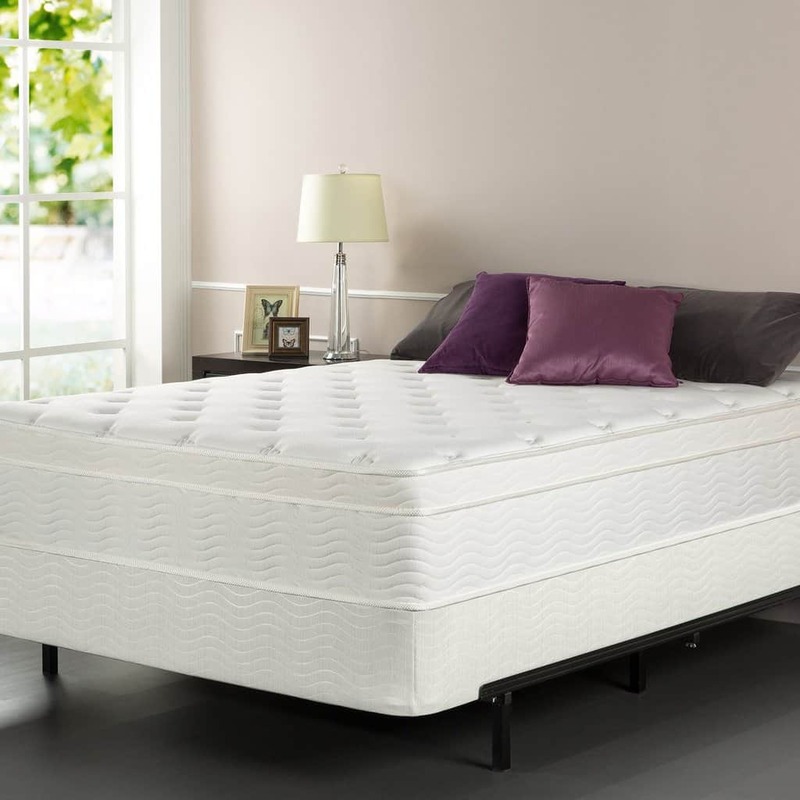 An adjustable air bed can allow you to change your mattress to the level of comfort you need each night. These are popular choices for mattresses and they could be a good choice if you have arthritis. The best thing about these types of beds are that they are very easy on your joints. Memory foam can mold to the contours of your body eliminating painful pressure points and stress on your joints. Latex foam can also do this, with slightly more spring back than memory foam. The only thing you have to be careful of with foam mattresses is make sure you don’t choose one that is too soft. Memory foam especially can be difficult if you have arthritis because it can take a longer time to retain its shape which makes it hard to move around. This kind of bed is different than a traditional innerspring mattress because each coil is individually wrapped in its own pocket. Regular innerspring mattresses generally aren’t the best for people with arthritis because they cause pressure points when you lay down. Pocketed coil cuts down on these pressure points because there is added fiber around each coil. You still get the good support of an innerspring mattress, but without the usual aches and pains. You can also find many pocketed coil mattresses with a foam or gel mattress covering so you can get that layer of soft comfort as well. What Other Sleep Tips Can Help My Arthritis? Sleep is so important, especially if you have arthritis. You want to make sure you’re well rested so that your symptoms don’t flare up. While the type of mattress that you use can either help or hurt your arthritis, it isn’t the only way to ease pain while you sleep. There are a few other things that you can try to make sleeping with arthritis easier. If you have a lot of heavy blankets and sheets on your bed, this might be contributing to pain in your joints. Heavy sheets make it hard to move and turn while you sleep while also putting extra pressure on possibly inflamed joints. You can use lighter sheets or buy a blanket lift to help keep heavy sheets off of your feet and knees. Also, try not to pile too many blankets on top of your bed while you sleep. The right mattress can help ease arthritis pain while you sleep, but it still might be a struggle to get in and out of bed. Putting your mattress onto an adjustable base can help you with this problem. Adjustable bed bases can lift your head or feet to allow you to get in and out of bed with ease which can cut down on unnecessary pain. Most mattresses will work with adjustable beds, so if you already have a mattress that you like, you might not have to buy a brand new one. This mattress is a good choice for people with arthritis because it combines three layers to make sure that the bed is both supportive and comfortable. The base layer is a therapeutic support layer, the middle is a ventilated memory foam, and the top layer is gel infused memory foam. The top layer is then covered with natural wool and a bamboo fiber cover. This bed also comes in eleven different sizes and it has a 25-year warranty. The bamboo cover is removable so you can easily wash it and the whole bed is naturally antimicrobial, hypoallergenic, and dust mite resistant. The Sleep Master iCoil mattress is a good example of a hybrid mattress. It uses pocket coil technology as the support base layer. Then on top of the coils there are three layers of different comfort foams and the whole mattress is wrapped in quilted fabric and a knitted cover. This particular bed also comes with a box spring set so you don’t have to purchase that separately. The mattress has a 10-year limited warranty and the box spring has a 5-year limited warranty. The foam used in the mattress is also CertiPur-US, so you don’t have to worry about it containing harsh or dangerous chemicals. This is another hybrid mattress that includes memory foam and a pocketed coil innerspring system. On top of the pocket coils, there are six different layers of memory foam. The top layer of memory foam includes gel to help keep the mattress and you cool while you sleep. The whole bed is wrapped in a quilted pillow top cover that has knit sides for even more ventilation. There are five different sizes to choose from and the mattress comes with a 10-year limited warranty. Another nice feature of this bed is that the combination of pocketed coils and memory foam helps cut down on motion transfer while you sleep. This mattress is made entirely of individually encased coils and then covered with a memory foam pillow top for extra comfort. The pillow top has a bamboo fiber cover to help absorb moisture and create a drier and cooler sleeping surface. The 744 individual coils help to evenly distribute your weight while you sleep and the 13.5 gauge on the coils make a supportive surface. This mattress is a little firmer than other mattresses, so if you need a strong supportive bed this might be a good choice for you. If you need something with a little more comfort this might not be the best mattress for your arthritis. This is an air bed system that uses air chambers and memory foam to create a comfortable sleep surface that is customized to your needs. Each side of the bed has their own individual remote control so you can adjust the air chambers to your preference. The air chambers are covered in two layers of memory foam with the top layer infused with gel to keep you cool while you sleep. The whole mattress is covered in a reversible seasonal cover. One side is made of bamboo fibers to keep you warmer in the cooler months and the other side is made with aloe vera gel to keep you cool in the warmer months. This bed is a little more expensive than other beds, but it comes with a 25-year warranty that covers the air mattress as well as the air pumping system.